DOT made the short block of South Elliott Place between Fulton Street and Lafayette Avenue car-free using paint and planters in 2012. Now it's made of more solid stuff. 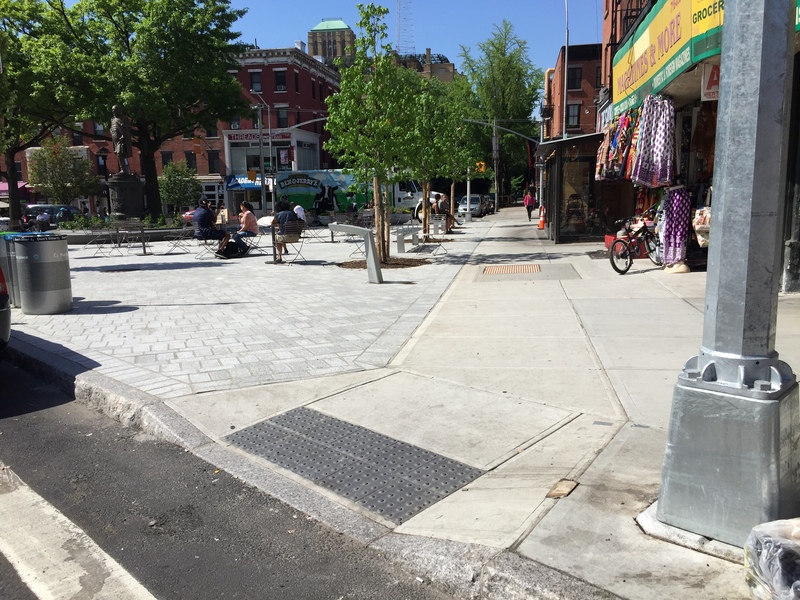 The permanent construction of Fowler Square Plaza in Fort Greene is complete, and it looks gorgeous. 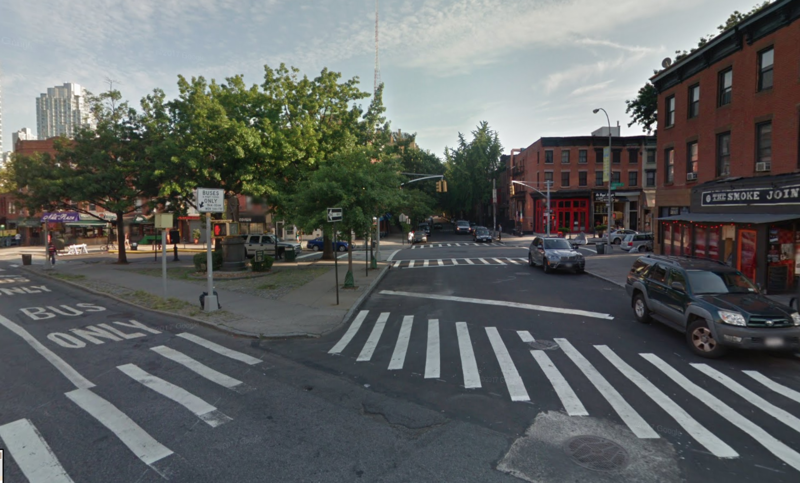 Six years ago, the short block of South Elliott Place between Fulton Street and Lafayette Avenue was a through street lined with parked cars. In 2012, DOT repurposed the street for people using its quick-build toolkit — paint, planters, and other temporary materials — enlarging the public space around the statue of Civil War officer Edward Fowler. The Department of Design and Construction began building out the plaza in concrete in January 2017. Work was expected to take nine months, but as is typical of DDC street projects, delays ensued and construction didn’t wrap up until last month. Looks wonderful. I hope those who opposed the project are able to enjoy this beautiful space! EVEN A WATER FOUNTAIN! Nicely done. So glad this is finally completed. Passed through this weekend and have one gripe. They left the a clear “sidewalk” path along Fulton so someone can continue walking curbside past the plaza. However, along Lafayette, the “sidewalk” path along the curb has trees, planters and stone benches forcing someone to zig zag around the center of the plaza to continue straight on Lafayette. The merchants on Fulton Street have aligned the Fowler Sq project and its “traffic disruption” to near-mutinous dissatisfaction with their Fulton Area Businesses Alliance (FAB) and director Philip Kellogg. I do hope they move on to other reasons to hate him.